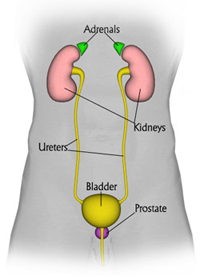 Glycosuria or proteinuria is cause for deferral of medical certificate issuance until additional studies determine the status of the endocrine and/or urinary systems. If the glycosuria has been determined not to be due to carbohydrate intolerance, the AME may issue the certificate. Trace or 1+ proteinuria in the absence of a history of renal disease is not cause for denial. The AME may request additional urinary tests when they are indicated by history or examination. These should be reported on FAA Form 8500-8 or attached to the form as an addendum. See General System, Item 48, for more details. Also see Item 47f, Substance Abuse section.